Hideyo Noguchi, also known as Seisaku Noguchi, was a prominent Japanese bacteriologist who in 1911 discovered the agent of syphilis as the cause of progressive paralytic disease. In biology, axenic describes the state of a culture in which only a single species, variety, or strain of organism is present and entirely free of all other contaminating organisms. The earliest axenic cultures were of bacteria or unicellular eukaryotes, but axenic cultures of many multicellular organisms are also possible. Axenic culture is an important tool for the study of symbiotic and parasitic organisms in a controlled environment. The ID50 (the dose needed to infect 50% of experimental subjects) is one via inhalation; i.e., inhalation of one organism will yield disease in 50% of the population. This is an extremely low infectious dose (only 1-10 organisms required), making C. burnetii one of the most infectious known organisms. Disease occurs in two stages: an acute stage that presents with headaches, chills, and respiratory symptoms, and an insidious chronic stage. Erythromycin is an antibiotic used for the treatment of a number of bacterial infections. This includes respiratory tract infections, skin infections, chlamydia infections, pelvic inflammatory disease, and syphilis. It may also be used during pregnancy to prevent Group B streptococcal infection in the newborn, as well as to improve delayed stomach emptying. It can be given intravenously and by mouth. An eye ointment is routinely recommended after delivery to prevent eye infections in the newborn. At least five completely sequenced genomes of Coxiella burnetii exist,  which contain about 2.1 Mbp of DNA each and encode around 2,100 open reading frames; 746 (or about 35%) of these genes have no known function. 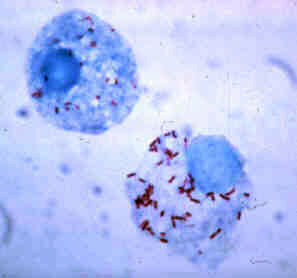 Wikimedia Commons has media related to Coxiella burnetii . Robert Joseph Huebner, was an American physician and virologist whose research into viruses, their causes and treatment that led to his breakthrough insights into the connections between viruses and cancer, leading to new treatments, as well as his hypothesized oncogene, which was discovered to be a trigger for normal cells turning cancerous. In cell biology, a phagosome is a vesicle formed around a particle engulfed by a phagocyte via phagocytosis. Professional phagocytes include macrophages, neutrophils, and dendritic cells (DCs). A phagosome is formed by the fusion of the cell membrane around a microorganism, a senescent cell or an apoptotic cell. Phagosomes have membrane-bound proteins to recruit and fuse with lysosomes to form mature phagolysosomes. The lysosomes contain hydrolytic enzymes and reactive oxygen species (ROS) which kill and digest the pathogens. Phagosomes can also form in non-professional phagocytes, but they can only engulf a smaller range of particles, and do not contain ROS. The useful materials from the digested particles are moved into the cytosol, and waste is removed by exocytosis. Phagosome formation is crucial for tissue homeostasis and both innate and adaptive host defense against pathogens. In biology, a phagolysosome, or endolysosome, is a cytoplasmic body formed by the fusion of a phagosome with a lysosome in a process that occurs during phagocytosis. Formation of phagolysosomes is essential for the intracellular destruction of microorganisms and pathogens. It takes place when the phagosome's and lysosome's membranes 'collide', at which point the lysosomal contents—including hydrolytic enzymes—are discharged into the phagosome in an explosive manner and digest the particles that the phagosome had ingested. Some products of the digestion are useful materials and are moved into the cytoplasm; others are exported by exocytosis. 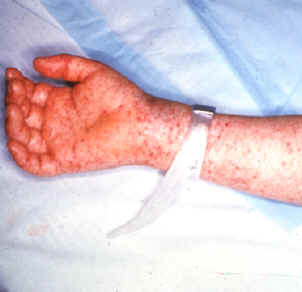 Rickettsia akari is a species of Rickettsia which causes rickettsialpox. Coxiella refers to a genus of Gram-negative bacteria in the family Coxiellaceae. It is named after Herald Rea Cox (1907–1986), an American bacteriologist. It is one of the Gammaproteobacteria. Didier Raoult is a French biologist. He holds MD and Ph.D. degrees and specializes in infectious diseases. ↑ Shaw, Edward I.; Voth, Daniel E. (2019-01-01). "Coxiella burnetii: A Pathogenic Intracellular Acidophile". Microbiology. 165 (1): 1–3. doi:10.1099/mic.0.000707. ISSN 1350-0872. ↑ Sankaran, Neeraja (2000). "Coxiella burnetii". Microbes and people : an A-Z of microorganisms in our lives. Phoenix, Arizona: The Oryx Press. p. 72. ISBN 1-57356-217-3. 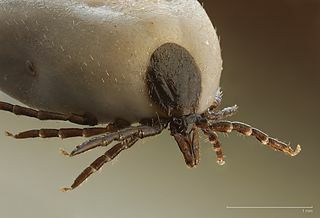 "In contrast to other rickettsiae, which are highly sensitive and easily killed by chemical disinfectants and changes in their surroundings, C. burnetii is highly resistant" & "Q fever". Centers for Disease Control and Prevention; National Center for Infectious Diseases; Division of Viral and Rickettsial Diseases; Viral and Rickettsial Zoonoses Branch. 2003-02-13. Retrieved 2006-05-24. "The organisms are resistant to heat, drying, and many common disinfectants." ↑ Tigertt, WD; Benenson, AS; Gochenour, WS (September 1961). "Airborne Q fever". Bacteriol Rev. 25: 285–93. PMC 441106 . PMID 13921201. ↑ Croddy, Eric C.; Hart, C. Perez-Armendariz J. (2002). Chemical and Biological Warfare. Springer. pp. 30–31. ISBN 0-387-95076-1. ↑ "Coxiella genomes in the PATRIC database" . Retrieved 1 October 2012. ↑ Warrier, I; Hicks, LD; Battisti, JM; Raghavan, R; Minnick, MF (2014). "Identification of novel small RNAs and characterization of the 6S RNA of Coxiella burnetii". PLOS ONE. 9 (6): e100147. doi:10.1371/journal.pone.0100147. PMC 4064990 . PMID 24949863.